Very early variety with high dry matter. 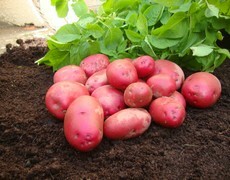 Dig early for lovely salad potatoes or mature for great bakers. 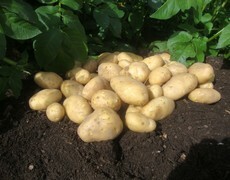 Arran Pilot Very early traditional potato, bred on the Isle of Arran and the most popular variety in the UK in the 1930s. Excellent yield and flavour. Casablanca Relatively new variety. Great skin finish making it a good candidate for the show bench. Makes very good chips. 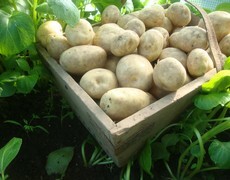 Colleen - Organic Has a good resistance to potato blight so is good to grow organically. 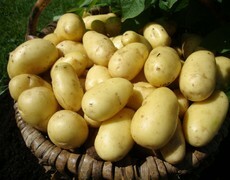 Excellent all-rounder with light yellow skin and yellow flesh. Good pest resistance. 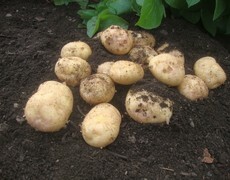 Duke of York Traditional early variety, harvest when young for a rich sweet flavour or leave to mature for a floury texture. Makes excellent baked potato. Epicure Traditionally known as 'Ayrshire Earlies'. A very good taste and texture. Recovers well from late frosts. 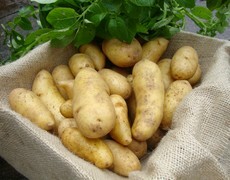 Foremost Foremost remains popular as a new potato with slightly waxy, firm white flesh and an excellent flavour. Very popular heritage variety. 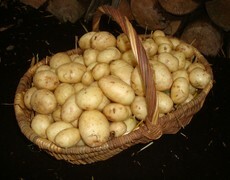 Offers high yields of great tasting potatoes. Lady Christl Very early salad type with high yields, good taste and nice bright skin finish. 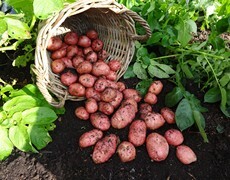 Grown commercially in Cornwall and Pembrokeshire. Maris Bard First early variety that bulks early. 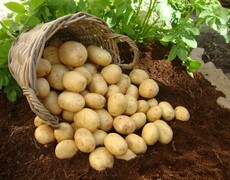 It is high yielding and has high potato numbers. 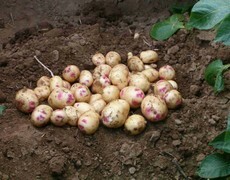 Pentland Javelin First early variety with good eelworm (golden) resistance . Very bright with a mild flavour. Red Duke of York A traditional red-skinned variety with a yellow flesh. Makes excellent roasts. 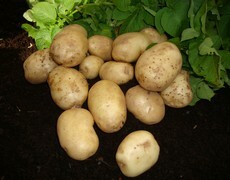 Rocket Recent variety, throws a large number of round whole potatoes. Early variety with good disease resistance. Sharpes Express Great tasting variety bred in Lincolnshire in 1901. This first early has a bright white flesh with a smooth skin. A favourite of gardener Percy Thrower. 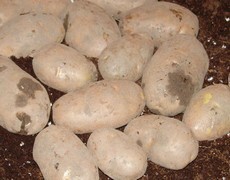 Swift Exceptionally early variety which produces lots of small round potatoes. It has partial resistance to both golden and white eelworm. 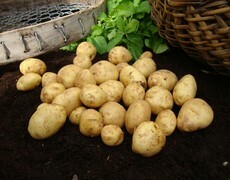 Winston An early variety that produces large potatoes and has very good drought resistance. British Queen Very popular in Ireland. It has a high dry matter with a floury texture and good flavour. Catriona Distinctive kidney-shaped potato with splashes of purple around the eyes. The yellow flesh has a good strong flavour. A vigorous variety with good yields. Divaa Good yielding variety with very bright skin and flesh. It has a fluffy texture making fantastic chip shop chips and great mash and roasts too. It has good resistance to eelworm. 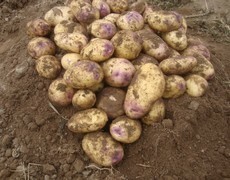 Estima Very popular variety with farmers. Large yields with early bulking properties and good drought resistance. 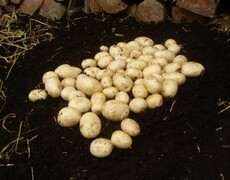 Gemson High yielding variety producing lots of small round potatoes. 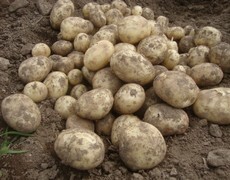 Bred from Maris Peer which gives it an excellent flavour. Kestrel Attractive whole skins with purple eyes. Makes excellent chips and roast potatoes. Good resistance to blackleg and slug damage. 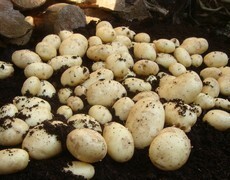 Marfona Very popular with farmers due to its ability to produce baking potatoes very early. Good bright skin finish and a nice flavour. Maris Peer Popular second early potatoes with a very good flavour. 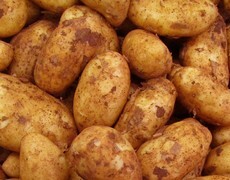 Are good as salad potatoes. Plant produces large clusters of pretty purple flowers. 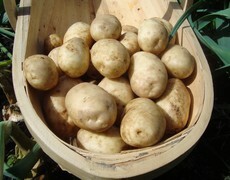 Nadine Exceptionally high yielding variety with bright white skins and a good entry for the show bench. Spunta Grown widely in Cyprus and imported to the UK supermarkets. 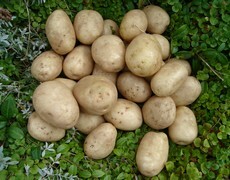 A white/yellow fleshed variety with a waxy texture making it a good candidate for a tasty potato salad. Wilja A high yielding variety with a russetted skin. 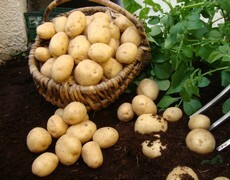 Will grow successfully in any type of soil and makes very nice tasting mash, baked and boiled potatoes. Charlotte A must have in the garden for a early salad potato crop. 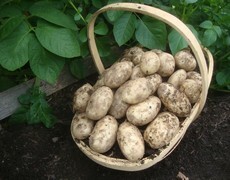 Very attractive long potato with an unbeatable creamy flavour straight from the garden to the pot! International Kidney Exceptionally good eating salad potato straight from the garden. Nicola High yielding salad crop with a bright yellow flesh. 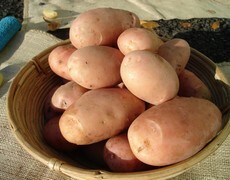 Makes a very tasty salad potato with a waxy texture. 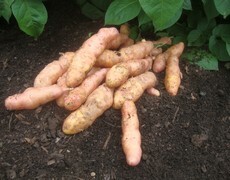 Pink Fir Apple Popular in Victorian kitchen gardens this knobbly salad potato has an unrivalled nutty flavour. Cooking with the the skin on will retain it's pink skin colour. Cara Big-yielding variety with an attractive skin. Good resistance to blight and is good for long term storing. Plenty of size and is a good one to grow for a baker crop. 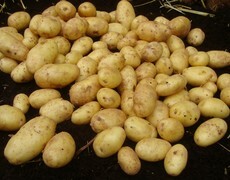 Fully blight resistant variety that has an attractive appearance. It is ideal for growing in an organic plot. It has a good level of dry matter making tasty roast potatoes and fluffy mash potatoes. 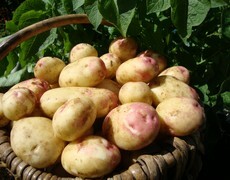 Desiree The most popular red-skinned variety in the UK giving great crops of large potatoes. Regularly seen on TV being used by celebrity chefs. 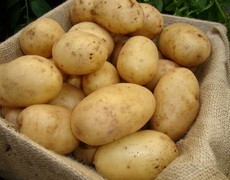 A good culinary potato which boils well and has a delicious smooth texture. 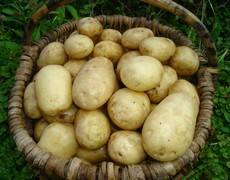 Golden Wonder A traditional, heritage variety with a russet skin and a golden colour. Excellent roasted, baked or fried but not boiled. 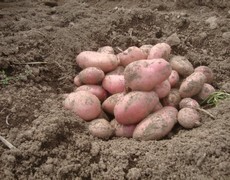 Kerrs Pink A favourite in Ireland with an unusual pale pink skin with darker pink eyes. 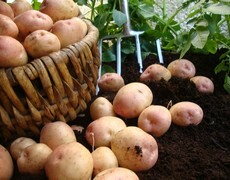 It is a robust plant, producing a large crop of bold tasty potatoes. 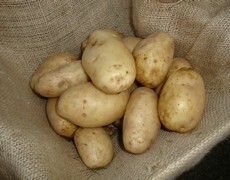 King Edward A well known favourite in the potato world. Attractive white skins with bright splashes of red. 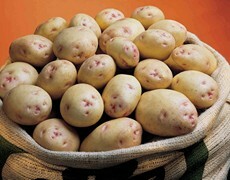 Makes the ideal roasts and baked potatoes but is also good boiled with a strong, aromatic flavour. Kingsman is brand new for 2017. It produces big, bold, uniform tubers. 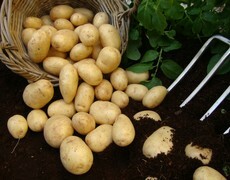 It has good disease resistance including golden potato cyst nematode. These potatoes make great home-style chips. Majestic A very popular variety in war-time Britain. 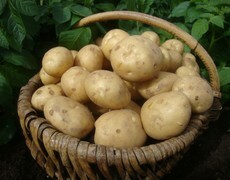 It produces lots of potatoes with plenty of size. 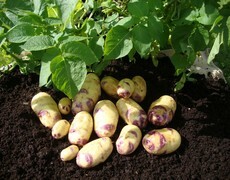 Maris Piper Probably the best known potato in Britain and one of the most versatile with an attractive plant with purple flowers. 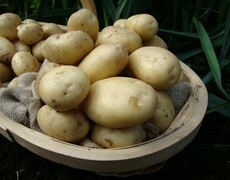 The potatoes taste great as chips, mash, roasts or simply boiled. This fairly recent variety is very popular with chip shops throughout the UK. It is long, smooth and shallow eyes making it an ideal shape for producing the perfect chip. Markies is a main crop with good disease resistance. 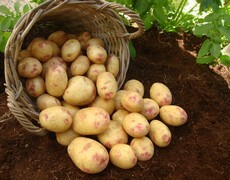 As well as making good quality chips it also makes delicious roast and mash potatoes. Mayan Gold Mayan Gold originated from the foothills of the Andes of Peru. It is a golden coloured potato with a nutty flavour proving to be an exceptional variety for chips and roasting - a favourite gourmet potato with the chefs. Due to Mayan Gold's delicate nature it should be steamed and not boiled. Mozart Attractive red skin with yellow eyes and flesh. 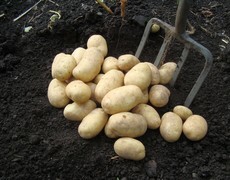 High-yielding crop with good disease resistance makes ideal mash, roasts and wedges. Good overall disease resistance ideal for growing in an organic vegetable plot. 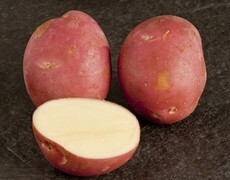 Attractive red skin with contrasting white flesh. Makes fantastic mash, roasts and chips. 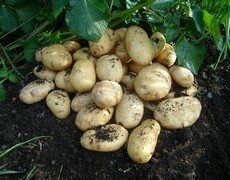 Pentland Crown Bred near to the Pentland hills outside Edinburgh this variety produces large crops of bold potatoes. 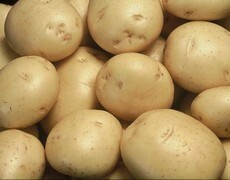 It has a good resistance to scab which can be unsightly on the potato skins. Picasso Bred from Cara but reaches maturity up to 3 weeks earlier. Great tasting variety with good disease resistance. Makes nice roasts and mash. Be the envy of the show bench with these attractive potatoes. Early maincrop with great disease resistance. Excellent flavour. 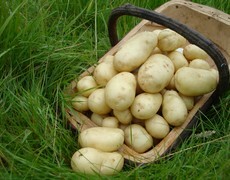 Record Was the number 1 crisping variety in the UK before paler crisps became more favourable. A very old and rare variety. 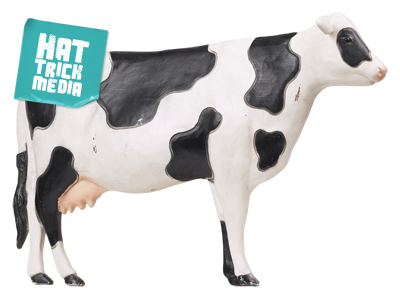 Makes great mash, chips and roasts. 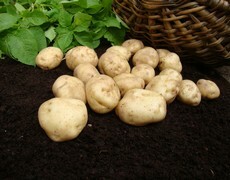 Sarpo Mira A pale red tuber with a fluffy texture renowned for it's excellent resistance to blight. Stemster A tasty red-skinned variety that produces lots of bold potatoes. 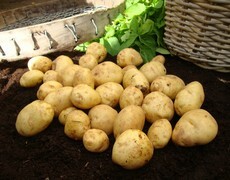 Very good grown in soils that dry out quickly as it has good drought resistance. 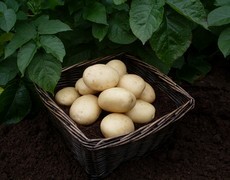 Vales Sovereign Attractive dual-coloured potato with excellent eating qualities. Great for mash, roasts and wedges. Good resistance to disease and ideal for the show bench. Valor An all-rounder that cooks every way and tastes great with the added bonus of having good disease resistance.